Creating a vision of the future different from those that have been imagined before—and one in which humans will flourish—requires it. MSc. 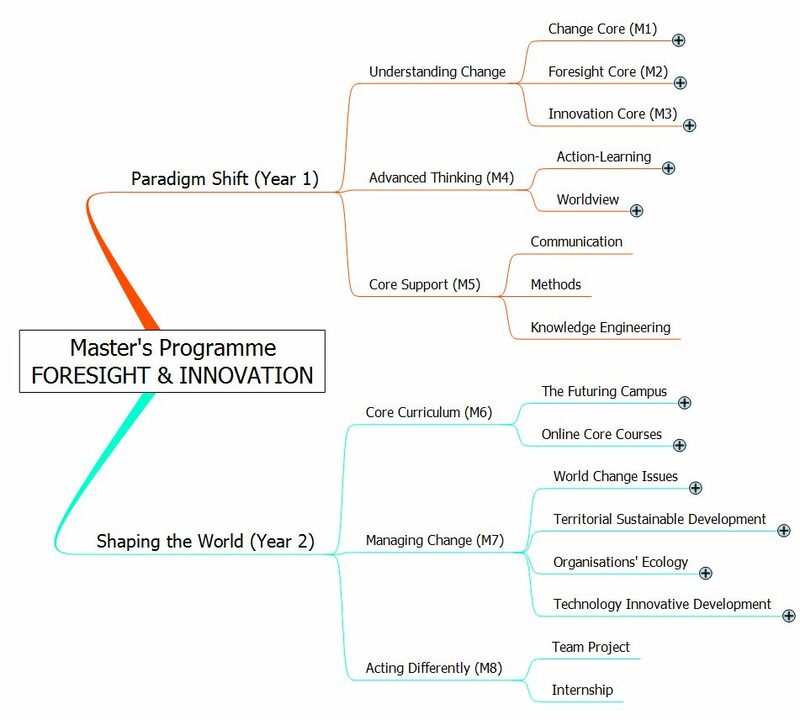 Foresight & Innovation, is a 2-year, full-time Master’s degree programme (4 semesters), taught exclusively in English. The Master’s program is based on the European Credit Transfer and Accumulation System (ECTS) whereby students earn 120 ECTS (60/year). MFI Students enrolled in this program are eligible for Student Membership in the Association of Professional Futurist (APF), and graduation from the program counts as one of the two criteria for Full Membership. Students’ work could be part of “The Student Recognition Program” which introduces students and their work to the members of the profession, raising their visibility and their career opportunities. Graduates will be eligible for membership of the the World Futures Studies Federation (WFSF). In addition, WFSF will welcome the students to join straightaway as student members and then to transfer into full membership upon graduation. Advice and support to turning an idea into a business project: innovation approaches, entrepreneurship process, etc. Creation of a Junior Enterprise, a local non-profit organization entirely managed by students. First Master’s students – year 2012-13 – will be responsible for its creation: design, name, etc. A junior enterprise is a local non-profit organization entirely managed by students. Related to their field of studies the students offer consulting services to the market; experiencing unique learning opportunities by doing professional project work on the one side and managing small- to medium sized enterprises on the other, by doing this the students add practical experience to their theoretical skills. This is an opportunity for students to develop self confidence and experience entrepreneurship at an early stage in their careers, to add practical experience to the theoretical skills and to provide private business with state-of-the-art knowledge from university. Due to the particularity of the Junior Enterprise work, the students distinguish themselves for example by their soft skills such as entrepreneurial spirit, team-working, creativity, presentation skills, public speaking, networking and intercultural understanding, work experience, and project management. The Latin word alumnus means “foster son, pupil” and is derived from the verb alere, “to nourish”. Thus, the alumni are the former students of this master programme. Focused alumni activities will be promoted. The twofold goal is to build a community of former students and to provide mentoring opportunities between current and former students. An annual Alumni Conference will be held in Angers each September. The Master’s External Relations office will work with alumni to organize this event, which will include a Future Challenge and a Utopia Veglione (science-fiction oriented masquerade ball).